On 24 April 2013, Metropolitan Hilarion of Volokolamsk, chairman of the Moscow Patriarchate’s Department for External Church Relations, currently on a working visit to Germany with the blessing of His Holiness Patriarch Kirill of Moscow and All Russia, met with Ms Emily Huber, State Secretary of the German Federal Foreign Office at the Ministry of Foreign Affairs. 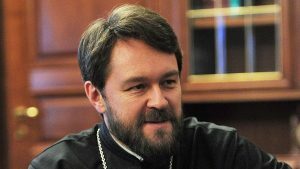 Metropolitan Hilarion told State Secretary Huber about joint Russian-German public projects, in which the Russian Orthodox Church takes part, including the “Petersburg Dialogue.’ He noted that the Moscow Patriarchate’s Department for External Church Relations has fruitfully participated in the activities of the working group of “The Churches in Europe” forum since its inception in 2007. This group unites representatives of the Russian Orthodox Church, the Evangelical Lutheran Church and the Roman Catholic Church in Germany. They meet to discuss public and religious life in thee two countries. Discussed at the meeting were church-state relations in Russia, inter-Orthodox contacts and inter-religious dialogue with participation of the Russian Orthodox Church, and also the problem of eroding traditional values in the contemporary European society and the problems of family and marriage. 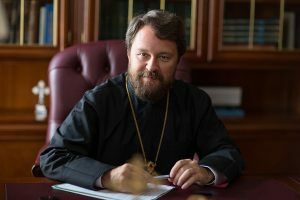 Metropolitan Hilarion paid a particular attention to the dire situation of Christians in certain Middle East countries. He believes that political changes and military conflicts in these countries have worsened the situation of many local Christian communities. Many thousand Christians were forced to leave their homes. Christian churches are destroyed, and Christians are subjected to violence. On April 22, the unidentified persons kidnapped and take to Turkey Metropolitan Paul of Aleppo, the Orthodox Church of Antioch, and Archbishop of Aleppo Mar Gregorios John Ibrahim of the Syriac Orthodox Church. 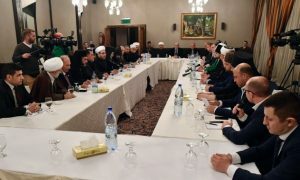 The mass media reported that the bishops had been released, but this information had not been confirmed by the facts as nobody has seen the bishops since their kidnapping. ‘In the long run, we are talking about the very existence of Christianity in the Middle East, where it has come into being and where the ancient Patriarchate are located, and we are worried,’ Metropolitan Hilarion said. He hopes that the German authorities will not be indifferent to the situation in Syria and will take effective measures for the sake of peaceful settlement in the country.